In their preface, the authors write: "Our prayer for you as you read this book echoes Blessed John Paul II's prayer for the church to contemplate the face of Christ as intimately as his mother, Mary, did. May you recognize the Lord wherever he manifests himself, but above all, in his living presence in the Eurcharist." 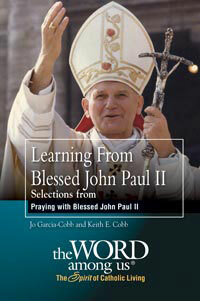 Selections are from the book Praying with Blessed John Paul II.